“This one’s for you,” said Carolyn Porco, leader of the imaging team monitoring the Saturn-circling Cassini spacecraft and friend of the late Carl Sagan, as she unveiled the mesmerizing new snapshot of Saturn she dedicated to the pioneering stargazer. 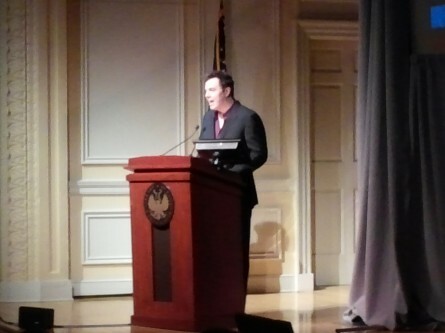 A rare scientific love fest on Capitol Hill, the Tuesday gathering of academics and entertainers at the Library of Congress was spearheaded by subversive cartoonist and trash-talking teddy bear creator Seth MacFarlane. 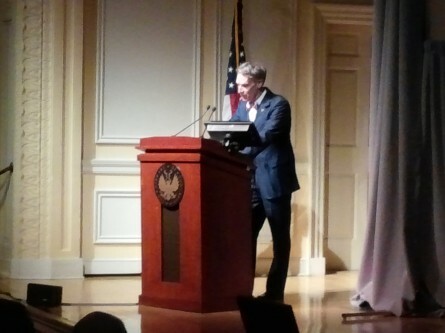 The comedian, via his charitable foundation, helped make the “Seth MacFarlane Collection of Carl Sagan and Ann Druyan” available to the Library of Congress. Librarian of Congress James H. Billington giddily welcomed the addition of the 1,705 boxes of archival material chronicling Sagan’s deeply inquisitive life. “It is exciting that the rich Sagan-Druyan archive is joining other great collections of scientific knowledge,” he said of the treasure trove of documents set aside for credentialed researchers. While he had nothing but complimentary things to say about Sagan, MacFarlane unloaded on both political parties for failing the scientific community. He lambasted the far right for making too much noise (“Evolution really happened. It’s not in debate,” he jeered, adding, “I’ve never seen gravity questioned”), while browbeating the left for remaining eerily silent. “They’ve allowed it to fester,” MacFarlane said of the cacophony of flat-Earth-style rumblings resonating in the national echo chamber. Luckily, the gagman wasn’t all gloom and doom. He joked about tuning into a rerun of the short-lived sci-fi series “seaQuest DSV” (“I was debating whether to take the whole bottle of sleeping pills then or during the end credits,” he quipped) and described how humbling it’s been working alongside Sagan’s brainy counterpart, Druyan, on a “Cosmos” series reboot. Before becoming TV’s go-to “science guy,” Bill Nye was one of Sagan’s astronomy students. He thanked Sagan for teaching him to question everything. “He made me a skeptic. He made me a critical thinker,” Nye said. White House aide John P. Holdren plugged President Barack Obama’s three-pronged strategy for fostering a more science-savvy populous, a plan focused on: stimulating the next generation of “inventors and discoverers,” shoring up a high-tech trained workforce and sparking general interest in science. As part of that mission, Holdren said the administration wants America to lead the way in high-speed computing, earth-scanning satellites (paging PRISM!) and outer-space-scouring telescopes.